How was 2012 for Apnaplan.com? Its last day of the year and it’s a good time to reflect on how the year was and to plan for the next. Keeping this in mind I thought of sharing my thoughts on ApnaPlan.com and how was the year 2012 for this blog. Around 3.21 Lakhs people visited Apnaplan.com in 2012 leading to around 5.86 Lakhs page views. April turned out to be the best month with around 53,000 visitors and 1,05,000 page views. Below is the chart showing monthly breakup of visitors and page views. 2013 Target: I would like to reach 1 Million page views in 2013. This can happen one by bringing more visitors to the site and secondly by encouraging more page views per visitor. 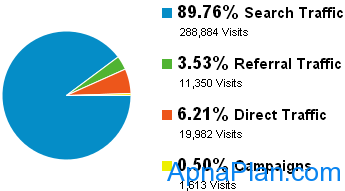 Apnaplan.com got about 90% of traffic from search engines. This is great news. Below is the breakup of traffic sources. I had written 210 posts on ApnaPlan.com in 2012. The posts have been erratic as I had done around 60 posts in March while just 1 in October. The good news is the Income tax calculator in Excel for 2012-13 posted in March 2012 had more than 2.1 Lakhs download. LIC Jeevan Vriddhi – Should you invest? The Alexa traffic Rank as of today is 144,873, while the website is ranked 16,861 in India. This I think is good for one and half year old blog. 2013 Target: Would love to see Apnaplan.com in top 1 Lakh sites worldwide according to Alexa Ranking. Also would like to go below 10,000 in Indian Ranking. As of today there are 866 subscribers using feedburner. The Facebook page of Apnaplan.com has 90 Likes. I need to work on this and increase the likes on Facebook. 2013 Target: Plan to have an average of 5 new subscribers through feedburner every day and average of one Like from Facebook per day. As of today I have only Infolinks on the site. This is not a great revenue generator and has generated USD 322 in 2012. Below is the monthly breakup of Infolinks revenue. I tried Chitika and other affiliate programs but didn’t find them good enough. 2013 Plan: Need to get Google Adsense on my website. This can increase the revenue to USD 3-5 per day. So can expect USD 1,000 – 1,800 in a year. No update from long time. Now as you got adsense, mind sharing the details? Hey Amit, Good to know someone who is deeply interested in the same field as me. Am happy to help with writing articles / doing analysis for new investment avenues / financial planning case studies. Do let me know and shall be happy to contribute. Its a pleasure to hear from you. I would for sure contact you for articles and financial planning cases. This is an excellent piece of information. There are millions of blogs but most of them do not share these kind of details. Keep the good work and may you excel further in blogging.